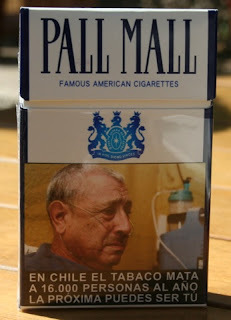 My Life in Chile: Smoking: It kills. 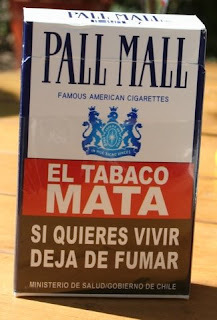 "In Chile, tobacco kills 16,000 people a year. The next could be you." I’m not a fan of smoking. In all honesty, I think it’s disgusting. Of all the pollutants that we are exposed to in this world, why would one choose to put MORE into their body? I won’t rant about how much I dislike smoking, but it’s still something I don’t understand. One of the first things I noticed about Chileans is that so many of them smoke! It’s uncommon NOT to smoke here and for this reason, I’ve become more accustomed to people smoking and being places where there are no rules against such behavior. I still choke when the lady sitting next to me on the bus smells like an ashtray or the smoke from the person in front of me blows into my face, suffocating me on the street. But, it’s a cultural difference that I have had to get used to. What amuses me about smoking here though is that the cigarette packages have this awful image of a man portraying the possible results from smoking. Not to mention all of the writing informing people of the health affects. My friend and I had to laugh the other day when we discovered that our university store/cafeteria doesn’t sell Tylenol of any sort, but certainly provides cigarettes for purchasing. Only food and cigs.